Product prices and availability are accurate as of 2019-04-19 20:02:49 UTC and are subject to change. Any price and availability information displayed on http://www.amazon.com/ at the time of purchase will apply to the purchase of this product. Our Tix Solder melts at 275°F but is much stronger than other Lead or Tin Solders. Does not tarnish and can be used to solder Platinum, Gold, Silver, Stainless Steel, Pewter and many other alloys. Use with torch or soldering iron. Tix Flux is specifically designed to work with Tix Solder, a low melting lead/tin based solder. With Tix Solder's melting point of only 275*, it's important to have a flux which flows at a much lower temperature, and this product is an ideal match. Tix Flux can be used with almost any soft solder, and cleans up with water. Tix Anti-Flux is an excellent solution to use on areas where you wish to prevent solder from flowing such as screw threads, clasps, adjacent soldered connections, and more. Just brush a little onto any area where you don't want solder to flow, and Tix Anti-Flux will stop it cold! Brushes on easily and cleans up with water. Works best with Tix Solder. 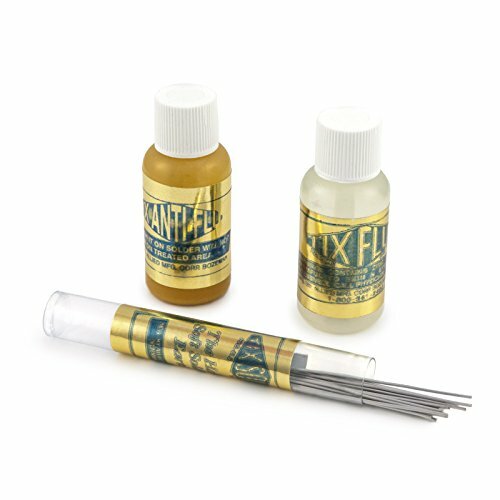 Kits Contains: Tix Solder: 1/4 ounce tube (20 sticks) Tix Flux: 1/2 fluid ounce Tix Anti-Flux: 1/2 fluid ounce Our Tix Solder melts at 275°F but is much stronger than other Lead or Tin Solders. Does not tarnish and can be used to solder Platinum, Gold, Silver, Stainless Steel, Pewter and many other alloys. Use with torch or soldering iron.